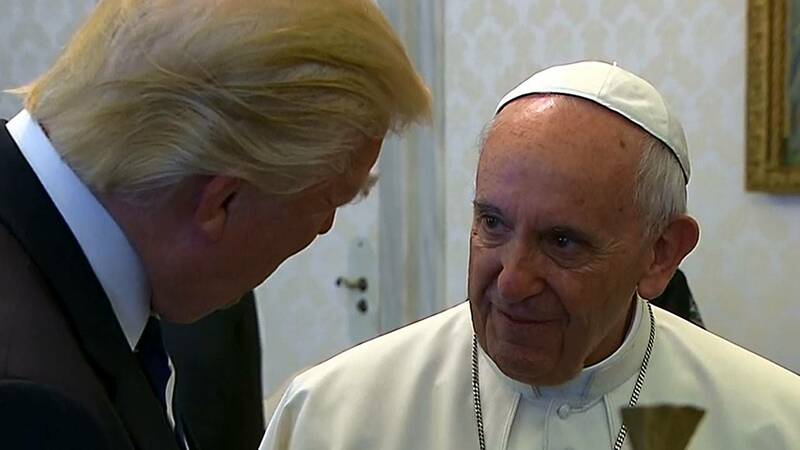 VATICAN CITY (CNN) - After a highly anticipated meeting, Pope Francis appears to have left his mark on President Donald Trump. "Thank you. I won't forget what you said," Trump told Pope Francis, before leaving the Pope's private study after a half-hour private meeting. Neither Trump nor the Pope revealed what their conversation entailed, but readouts from the White House and the Vatican highlighted terrorism, climate change and peace as agenda items covered. Secretary of State Rex Tillerson, briefing reporters on Air Force One after the meeting, said terrorism and climate change came up. He said the Vatican's secretary of state raised climate change and encouraged Trump to remain in the Paris agreement. Tillerson said the President "hasn't made a final decision," and likely will not until "after we get home." In a statement, the Vatican said only that the two men discussed "the promotion of peace in the world through political negotiation and interreligious dialogue" and homed in on the need to protect Christians in the Middle East. "He is something," Trump said of the Pope later in the day, during a meeting with Italian Prime Minister Paolo Gentiloni. "We had a fantastic meeting. We're liking Italy very, very much and it was an honor to be with the Pope." But while their words were sparse in front of the cameras, the two men sent signals about what they hoped to get out of the meeting -- and the images they hoped to broadcast. The cameras and a clutch of reporters followed as the Pope welcomed Trump into his private study, where the mood appeared stiff at first -- as though the war of words the two men had previously exchanged hung over the room. While Trump flashed a wide grin, the Pope offered only a modest smile -- his demeanor, business-like. The 2016 US presidential campaign saw the two men broadcast dueling messages to the world. As Trump promised to ban Syrian refugees, stoke anti-Muslim sentiment in the US and promise to build a wall on the US-Mexico border, the Pope spoke out. Without naming Trump by name, the Pope said in February 2016 that "a person who only thinks about building walls, wherever they may be, and not building bridges, is not Christian." That prompted a fierce response from Trump, who fired back by calling Francis' judgmental comment "disgraceful." There was never an apology in either direction. The Vatican highlighted in its statement that it hopes to continue providing "assistance to immigrants" as well as health care and education services in the US. As the two men allowed the cameras back into the room as their first in-person encounter wrapped on Tuesday, the mood appeared to have lightened. When the men exchanged gifts, the Pope smiled more broadly and easily. "This is a gift for you. These are books from Martin Luther King. I think you will enjoy them," Trump told Francis, as he presented him with a first-edition set of King's writings, recalling the Pope's address to Congress in 2015 in which he quoted King. The Pope's gift left no questions about its symbolism, presenting Trump with an olive tree medal crafted by a Roman artist that the Pope said symbolizes peace. "We can use peace," Trump said. "I signed it personally for you," the Pope offered. First lady Melania Trump, wearing a black lace dress and veil, also exchanged a few words with the Pope, who drew on her Slovenian heritage to make a personal connection. "What do you give him to eat, potizza?" the Pope asked the first lady, referring to a Slovenian treat. "Potizza," she said with a smile. The Pope blessed a rosary for the first lady, traded jokes with the first daughter, Ivanka Trump and husband Jared Kushner, and handed out tokens to the President's delegation. After introducing several members of his administration and staff -- from Secretary of State Rex Tillerson to his longtime communications aide Hope Hicks -- the President and first lady left for a private tour of the Sistine Chapel and St. Peter's Basilica. Their tour guide was Barbara Jatta, the first woman director of the Vatican Museums.